I think Krugman talks to hear his own voice. It surely can’t be to inform and educate. 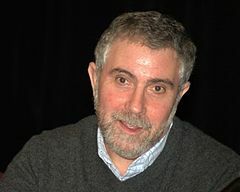 Krugman has been slated to head President Obama’s new department of Perpetual Motion Machines. Economic contraptions and gimmicks that after initial stimulus provide effortless prosperity. Prosperity ten times the world average through ordinary work. Promises to numb western world populations with a bit of hope through their decline. The hippie dream lives, …the decline is accelerating. I was going to add my own comment about Mr. Krugman, but you guys have said pretty much all that needs to be said. Agreed. I’m so tired of hearing Kurgman’s name. This flavor of the month ‘economist’ is about as close as I can imagine to a real life Ellsworth Toohey out of an Ayn Rand novel. What a turd. Krugman’s a moron. Why does anyone give him the time of day.